Audio Note Japan (KONDO) strives for the utmost quality in their hand-built gear. Their dedication derives from a strong passion for things pure, simple and beautiful. This philosophy is followed closely from design to performance, providing a product that is both aesthetically simple and expresses sound with perfect beauty. Audio Note Japan is the apex of audio perfection and world renowned for their musical splendor. From the tube power to elect the direct heat triode characteristics and good sound quality, (OPT) has adopted the manufactured goods of its own sterling silver wound output transformer.Manufactured goods is also its film capacitor electrode and a silver foil were also net. Give effect to the chassis material quality is large, in order to obtain the quality of growth in the open, we use the traditional pure copper. The products are manufactured by engineers carefully arranged lines also skilled. Expand the sound field is quiet vast, dynamic expression, boasts a sound quality beyond the traditional clear tube amp. In 1989, it is a glorious year of audio step has begun. ONGAKU was born in this year became the thing to attract audio fans all over the world immediately. Vacuum tube amplifier audio notes played a global expansion, has been praised in the magazine with such audio magazine, “The Absolute Sound” magazine “Hi-Fi Choice”, the eye tough choice.ONGAKU that are configured with a large vacuum tube 211 in particular, in the expressive power of music with its overwhelmingly rich, I was captivated by a quasi – audio fans around the world. Even now, without having to change its evaluation, ONGAKU spinning the magic of sound. Asked reputation in the audio notes, thus fame was built. In order to realize a transformer with a good performance at high impedance and say 12kΩ, has taken the structure of the winding multilayer division. Transformer has been wound by hand alignment of skilled technicians dish dish wire is sterling silver wire all of the original course. Is an important part to give moisture to the quality and dignity in a direct and clear with the 211. In addition, we produce in a special way, taking into consideration the high voltage to be used in, we proceed with the winding insulation grease. Condenser is a film and an electrode of pure silver foil. May not have a structure subjected to anti-vibration of the foil, make muddy the sound up to large signal from weak signals. We produce all in-house to maintain high quality. All sterling silver wire wiring material. Special structure is covered with a sheath that is wound around the wire on the exterior with natural silk in order not to be in direct contact with the exterior of vinyl chloride also, holding the unwanted vibration of the wire. Is a power amplifier boasts a maximum output audio notes while taking advantage of the legendary circuit of ONGAKU. GAKUON-II with an output of 50W in Class-A operation, with a margin to drive low efficiency speakers also. Driven by a dedicated driver for each of the two output tubes, forming a sound field of the handlebars. Has taken the structure of the multilayer division of its own winding representation impossible to talk using only silver wire, with rich sound honest. Transformer has been wound by hand alignment of skilled technicians dish dish wire is sterling silver wire all of the original course. Is an important part to give moisture to the quality and dignity of the 211 with a straight and clear. In addition, we produce in a special way, taking into consideration the high voltage to be used in, we proceed with the winding insulation grease. Condenser is a film and an electrode of pure silver foil. Coupling capacitor to seriously affect the quality of vacuum tube amplifier, was subjected to anti-vibration of the foil. Prevaricate without a large signal to noise from weak signals, and accurate music transmission is possible. We produce all in-house one by one in order to maintain high quality. – Driven by a dedicated driver for each of the two output tubes in parallel single-configuration. – Recommended for those who want to enjoy a more dynamic sound quality of 211 in the direct sharp. This is a stereo power amplifier to maximize the attractiveness of low-plump with a 2A3. Has taken the structure of the multilayer division of its own winding can not even express in any other silver wire with copper wire, with rich sound straightforward. Transformer has been wound by hand alignment of skilled technicians dish dish wire is sterling silver wire all of the original course. Condenser is a film and an electrode of pure silver foil. Coupling capacitor to seriously affect the quality of vacuum tube amplifier, was subjected to anti-vibration of the foil. Prevaricate without a large signal to noise from weak signals, and accurate music transmission is possible. All sterling silver wire wiring material. Exterior structure is covered with a sheath wrapped around the wire on it in the natural silk in order not to be in direct contact with the exterior of vinyl chloride also, holding the unwanted vibration of the wire. 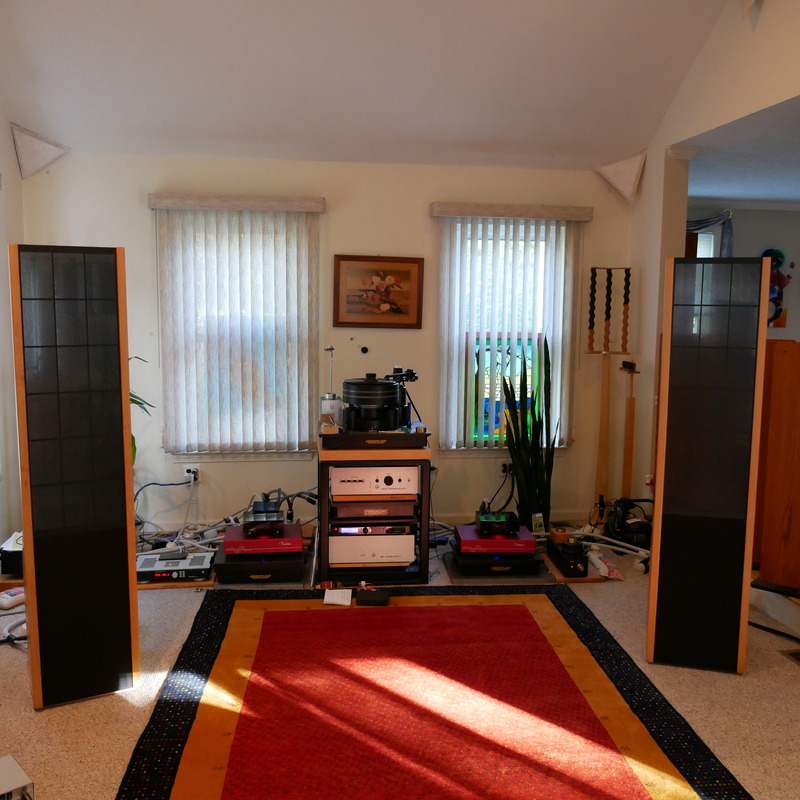 As the most important equipment for playing records, has been working on the commercialization of the preamplifier From its inception, audio notes. Additional functions such as the tone control is not remembering, anything that can cause degradation of sound quality is the transmission path has been configured with a simple to eliminate as much as possible. Give effect to the chassis material quality is large, in order to obtain the quality of growth in the open, we use the traditional pure copper in the preamp. Can be independent and separate amplification unit into the chassis power supply circuit, has eliminated to limit the impact of the leakage magnetic flux generated from the power transformer, etc.. Provided a dedicated power transformer (optional) to each line amplifier, Fonoanpu, we have further isolated the power supply circuit of the left and right. In addition, the low impedance smoothing circuit that is configured with audio grade oil capacitor and double choke has to make your music playback with a growth in the clear. – Adopt a cap-less resistance attenuator switching high-quality sound. Adopt a low-impedance power-supply circuit that is configured double power transformer, filter choke, by audio grade oil capacitor. Line CR type phono equalizer and non-feedback amplifier, the sound field to reproduce the spontaneous and natural only. Chassis structure consists of two boxes that are two minutes left and right inside the chassis. By placing the power supply unit independently to the left, has eliminated the influence of the magnetic flux leakage, etc. give the amplification section. Built to last a lifetime, the KSL-M77 preamplifier is sure to become a classic. The KSL-M77 has especially been designed and engineered to achieve solid low frequencies and clarity in sound. A record contains amazingly huge amounts of information, the existence of which are not discovered through conventional combinations of resistors and capacitors, wiring method, and power supply circuit. The M77 phono stage (MM) has proven to have tremendously high resolution properties to present all this information, musically. The KSL-M77 has handmade silver foil coupling capacitors and resistors, and a single chassis comprised of two separate chambers. The M77 has been developed from the famous M10, and follows on from the M100. Effectively deploy the parts were selected aiming to balance the sound from the old to make specs and modern, repeat the audition over an enormous amount of time. Newly developed heater circuit considering the influence power circuit, short signal path with no waste, to a reasonable sound quality and powerful. Preamplifier charm of the sound is not only fully draw the vacuum tube amplifier, also in connection with the transistor amplifier is now complete. The Kondo G-70 is Kondo’s most affordable preamplifier yet. Now more music lovers can experience the Kondo quality. Launched in Dec 2010.
component placements, signal wiring and ground layout. selections of each resistor and capacitor. – Direct plate method follower circuit, the cathode follower. Ensure a sense of freshness and direct sound and the low output impedance. Employs a 6072 tube. – Minimize the loop signal by modularity and decoupling capacitors of the line amplifier. – Parts adopt high quality superimposed the audition, SSW (Silk Silver wire), silver foil capacitor, and original power transformer. Copper chassis. – New development to test the effects give the sound the heater circuit. – Aiming for a good and familiar tone pure tone rather than ornate, like spring water. And realize the goodness of hand-wiring, the shortness of the route of the waves by the modularization of the printed circuit board line amplifier part. It also has to minimize the signal loop placed in the independent left and right decoupling capacitor near the line amplifier module. Connection with the consideration of transistor amplifier, impedance 1kΩ output, 20Hz cut-off frequency has (at load 20kΩ). High-grade volume, copper chassis, pure silver foil capacitors, electrolytic capacitors original, sterling silver lead resistance, wiring material SSW, ultra-high-quality parts are adopted KSL-VzII (sterling silver wire shield), the original RCA jack, such as the original power transformer. Three types metal film resistors, wirewound type of enamel. Capacitors are five types of block type and tubular type aluminum electrolytic capacitors pure silver foil, polypropylene capacitors, ceramic capacitors. Effectively presented on the CR were carefully selected parts. Rectifier tube adopts a 6X4. The original power transformer repeated audition, and that the appropriate damping treatment have been made. You have configured the power supply unit by performing powerful circuit design clearly separates (700μF/ch about) and a decoupling capacitor (400μF) ripple filter capacitor, the design implementation. Decoupling capacitors while holding the habit of each capacitor (600 +100 +0.47 μF / ch), has contributed to the tone of good temperament are composed of three types of capacitors. Various test results, heating circuit to guarantee the stability of the DC ignition voltage variations and the ability to remove a powerful ripple adopted a circuit using a transistor TO-3 type. And low impedance design with DC line, achieve a high purity quality. In addition to achieve sound, strong and vigorous adoption of CR diode bridge parts were selected to audition repeated, large. Small high-end audio system also convince music lovers. Integrated amplifier aimed at small systems serving also accept music lovers. High quality, high-quality well-balanced tone and delicate simple dynamic. In the high-end audio system prone to large-scale, As you can also accept music lovers, to develop a simple and high-quality integrated amplifier. – The output tube to ensure the output of more than 30W adopted (our first) EL34, also assumes the use of low-efficiency speakers in the sphere of pentode inscription. Corresponding to the output 8Ω and 4Ω. – In order to balance a high-dimensional dynamic and delicate tone of the EL34, a new design re-examine the push-pull circuit of the amplifier circuit inscription of the past and repeated deliberation from a new perspective. – Sufficient to meet modern specifications, aiming for high-quality well-balanced tone. Directly connected to the driver circuit and the stage – the first stage, the coupling of the output stage employs a pure silver foil capacitor. Moreover, to the low impedance of the entire circuit, realize the direct sound. Was adopted in the output stage, CCB newly developed circuit (constant current bias), prevents the music signal flowing into the VR bias adjustment, which enables signal transmission of high purity. That the transformer output connection and UL, only the amount reduced to 3dB NFB, has been achieved by a sense of dynamic and low distortion. In addition, by making the circuit unit, enabling a minimum of wiring. High quality parts group superimposed audition. 50-inch high-quality volume, lead resistance sterling silver, pure silver foil capacitor SSW (Silk Silver wire), KSL-Vz Ⅱ (shielded wire), custom output transformer and power transformer manufactured by ISO. Are effectively presented on the CR were carefully selected parts. By the choke coil and a large capacity capacitor group, as Integrated amplifier circuit has an unusual large-scale power. Moreover, the ripple filter is equipped with a decoupling capacitor in the independent left and right of each stage separately. The first has a large capacity and about 500μF/ch In particular, the improvement of channel separation was achieved with a clear tone to the lowest frequencies. D / A conversion by the converter with sample rate, and low jitter crystal clock generator master, does not depend on the accuracy of the transport is now possible. of all the input digital signal is converted to a signal of fs = 96kHz, 24bit sample rate converter. Produces a low-jitter digital signal at this time, high-speed, high precision arithmetic is performed under the control of high-precision master clock, which is separated from the input signal, low-distortion. first, and then cut the ultra-high frequency noise from the digital circuit in a passive lowpass filter. Then, unnecessary high frequency noise will be cut by two active lowpass filter vacuum tube. Silver foil capacitor, such as wiring material is made ​​of sterling silver company, KSL-DAC technology made ​​by KSL is committed to high quality music playback. Their sound is described as “awaken the soul of the artist who carved the groove sound” is the natural sound itself is straightforward. Magnetoresistance decreases by increasing the thickness of the yoke of the magnetic circuit, out of the goodness of that much difference. High-resolution playback improvements in resonant mode of vibration system, well-balanced over the entire band is now possible. Silver is said to be the first node from Houma trend in “trans-old” that it overturned the stereotype, MC transformer of audio notes, has been built up in the care of materials, meticulous best. Attitude of commitment to sound rich and natural sound, while expressing the nuances of fine surprisingly, the entire music will evoke a rich harmony. Functional beauty was born from necessity uncompromising. In order to realize the best analog sound we aim, we have completed a long development period fart. Turntable System “GINGA” of excellence. To achieve beautiful and vibrant sound to a dignified space. Analog to digital disk even though the source is now mainstream, valuable recording many are left, the start to develop, GINGA is aware of the following must be considered high-quality playback equipment than ever before has been designed to. Base portion is a result of repeated many times to audition, we used five effective material aluminum, stainless steel, brass, copper chromium, acrylic. Platter unit, the internal tapered shape, arranged on the outer circumference bottom stainless steel screw tuning has been kept a “bell-vibration”. In addition to the main material of aluminum, has been eliminated by the proper tone platter mat stainless steel and glass materials. The GINGA is equipped with a bearing very luxurious. Configure the carbide ball bearing bearing, rotor spindle by placing a large visceral further hardened steel of 8mm thick on top of the center pole of Φ25. In addition, by increasing the fulcrum has brought a more stable operation of the platter. Spindle pole and the rotor center is located in ultra-high precision machining to finish one pair of suit. Contact area of ball bearings and hardened steel, which is filled with special oil-tested, enabling a stable operation for many years without any oil leakage. Adopt a 4-pole synchronous motor large commitment to quality. Has been achieved low noise, low vibration double floating structure inside and outside the housing and housing, of metal shaving. We also pursue the ideal motor power circuit. SIN and COS waves generated by wave oscillation circuit CR, after amplification in 2-channel high power amplifier, have produced a very low distortion power has been boosted at each transformer. Phase-advancing capacitor is no longer required therefore. In addition, the control voltage of the main coil and the secondary coil of the motor and enables independence was achieved optimization of the motor drive voltage is like the smallest vibration. Be equipped with a tension pulley, multiplied by the appropriate long-term stable yarn tension is now available. Machine drive in order to solve the problem of yarn was from the traditional “knot of yarn”, has developed a new circle of yarn without knots. Special order to the UK SME companies. Equipped with a (Kondo-312) tone arm and screw material changes have been made (using the AN-AI of our products) over silver wire to wire-based arm of the SME-312. Sound of silver, warmer than any sound, you will see the full representation of music into sharp breath. In the audio notes, carefully, we have adopted to reproduce the music evolved more sophisticated silver. More than 20 years of know-how is a range of silver refining, manufacturing method, until the structure. In addition to the pursuit of material, by special technology – KSL, and then expressing the excellent music. Cable “AN-Vz” “AN-SPz silver wire was great reputation around the world from the audio fan” is, by KSL “technology has evolved further as KSL-LP” “KSL-SPz”. Space to reproduce the rich aroma of wine is dense, such as improved fundamentally and direction of the wire with the habit, mature. Rich bass sound gives a sense of stability to the music, a sense of low midrange distortion is represented beautifully the strings and space. * This specification is intended for all Japan. This is the only oxygen free copper speaker cable in the Kondo line, and this is also the only copper cable using KSL technology developed to remove the “sound roughness” which arises generally from the lower grade digital sound in the system like home theatre, for example. The heavily decoded signals from home theatre surround sound decoder and receivers usually comes with very unpleasant edginess and ear scratching sharpness, our KSL-SPc can greatly improve and transform this into a smooth and musical sound. Of course, it will be a great cable as well for audio only applications, especially where the source is primarily digital. Could you please give me a quote for Kondo 2a3 amplifire, excluding shipping cost? I also need quote for speaker cable (2.5 m pair) for both coper and silver version. I apprecaite your information soon. I will be coming to USA and would like to pick a few stuff from your beautiful collection. Do you no longer sell the M7 line stage and M7 phono? How does the M 77 compare? How is the phono stage ? We personally never liked the M77 we thought the original M7 was better. I would like a schematic of the Kagura amplifier. Sorry I don’t have one. You might try e-mailing Japan and request one but good luck they don’t give these things out.